UPDATE: Publisher Take-Two has now revealed the launch yielded $800m (£497m) around the world in the first 24 hours. The fifth instalment of Rockstar Games' Grand Theft Auto has enjoyed the most lucrative 24-hours in British gaming history, following its launch on Tuesday. 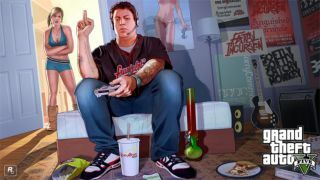 GTA V for Xbox 360 and Sony PS3 shifted a total of 1.57 million copies in the first full day on sale, raking in an impressive £65m in the process, according to figures from Chart Tracks. The record haul for the open world title eclipses the 1.41m units sold in the first 24 hours by Activision's Call of Duty: Black Ops game in November 2010. That launch brought in £58m on day one. Rockstar is yet to confirm its official sales figures. Gaming stores around the country opened at midnight on Tuesday morning as legions of GTA fans queued to be among the first to get their hands on the first full version of the franchise in five years. However, the launch event excitement didn't pass without an unsavoury incidence of life imitating art. Three teenagers have been arrested in London after a man was hit with a brick, stabbed and robbed of a copy of the game as he walked home from a midnight launch event. He is in a stable condition in hospital.